We’re takin’ the mystery out of disability history! Disability Network Southwest Michigan is pleased to bring you Disability Q&A to test your knowledge of disability-related topics. We post questions on Facebook and provide a link for you to check the answer and learn more about each topic. Q: What was the first state to enact legislation giving protection to people carrying white canes? 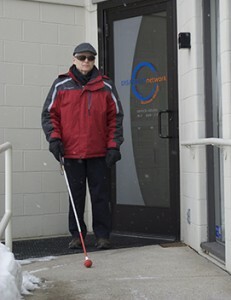 Although Peoria, Illinois was the first city to sign a White Cane Ordinance, Michigan was the first state to enact a statewide law providing White Cane protection. The White Cane has an interesting history which developed simultaneously in Europe and the United States. Originally people who were blind used a cane or staff as a navigational tool, but as the “white cane” developed as a symbol of blindness it served primarily as an indicator to others that the carrier had a visual disability. In 1937 as WWII veterans were returning home blind, Dr. Richard Hoover developed the “long cane” which returned the cane to being a functional way-finding tool once again. Follow this link for a complete history of the white cane. Follow us on Facebook to play along with Disability Q&A! You can view previous Disability Q&A postings by going to our News page and sorting on the category “Q&A” in the right hand column.